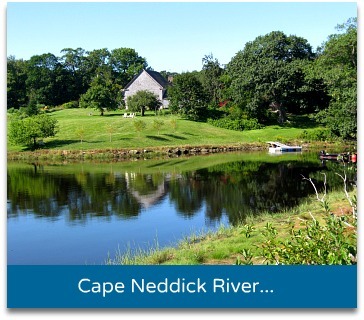 Cape Neddick is the largest and most rural section of York, yet it includes bustling York Beach as well. In roughly 4 square miles, you'll find one of the world's most famous lighthouses, terrific restaurants of every description, a hot dog stand that was written up in Gourmet magazine, an idyllic river, campgrounds, a beach, antique shops galore, beautiful inns and hotels, Maine's largest zoo, and high cliffs overlooking the ocean. Did I forget to mention the mountain? From the top of Mount Agamenticus you can see all the way to the White Mountains of New Hampshire on a clear day. And if just standing on top of the mountain isn't high enough for you, there's a nice fire tower for you to climb! You won't catch me up that high, though. If you're staying in Cape Neddick, you'll find that it's quieter than staying right in York Beach. But it's also very easy to drive or ride a bike from there to York Beach. When leaving the downtown York Beach area, drive north on Route 1A towards Ogunquit. Bear right onto Shore Road where the road splits at the Shore Road market. You might want to stop there and get one of their lobster rolls for the ride, too! Soon after, you'll see Cape Neddick beach on your right. From there, just go “straight” on Shore Road until it ends in Perkins Cove, Ogunquit. Shore Road is one of the LEAST straight roads I know, and you'd be well advised to go slow as you often can't see what's around the next bend. 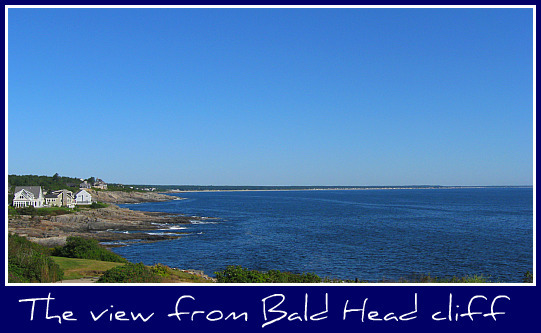 On the way, the road twists and turns past picturesque coves, antique Maine homes, the semi-private Cape Neddick Country Club (click here for their first tee web cam) and a beautiful small stone church right before the driveway of the Cliff House on Bald Head Cliff Road. The view from the top of Bald Head Cliff at the Cliff House resort is worth the detour, and if you're hungry when you get there, the Cliff House dining room is open to the public. Maine isn't a “fancy” place, for the most part. Like a lot of Maine people, there are many places that are quite reserved and plain on the outside, but filled with amazingly good things on the inside. Center for Wildlife . It's out on Mountain Road, on the drive up to Mount Agamenticus. The Center for Wildlife, which opened its doors in 1986, is the only facility in southern Maine dedicated to the rehabilitation of wild animals. Over 1,600 animals are brought to the Center each year from communities throughout Maine and New Hampshire. Most of the animals are suffering from infection, illness or injury. The causes and types of injury vary widely; perhaps a great blue heron became entangled in fishing lures, a red-tailed hawk was shot or poisoned or a cottontail was injured by a cat. Whatever the illness or injury, the Center provides the full range of diagnostic, treatment and recovery activities needed to maximize each animal's chance of returning to the wild. The other plain Maine place with really good things inside is Frankie & Johnny's restaurant on Route 1. Just head north on 1 from York, and it'll be on your left. You can't miss it. But you probably will, unless I tell you what's in there. This is Frankie & Johnny's. There is no way of knowing from looking at the outside that inside this little place fine dining awaits. More than fine dining; it's “food that loves you back” as Johnny says. I sent my brother and sister-in-law there recently and my sister-in-law said that it was one of the ten best meals she's ever had – and she's lived in a lot of places! Remember, it's strictly BYOB and cash or check, no credit cards. Open Thursday through Sunday for dinner (Wednesday through Sunday June to September), reservations are a must on weekends. If you get Denise as your waitress – and it'll be a very nice experience for you if you do - tell her I said hello. 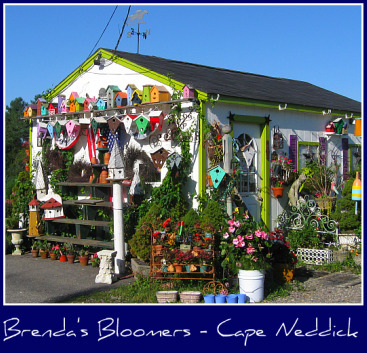 Whether you stay there, eat there, or just drive through there, you're sure to enjoy Cape Neddick, a beautiful little place with just about everything you need...even the tiniest flower shop in Maine!